Hi friends! 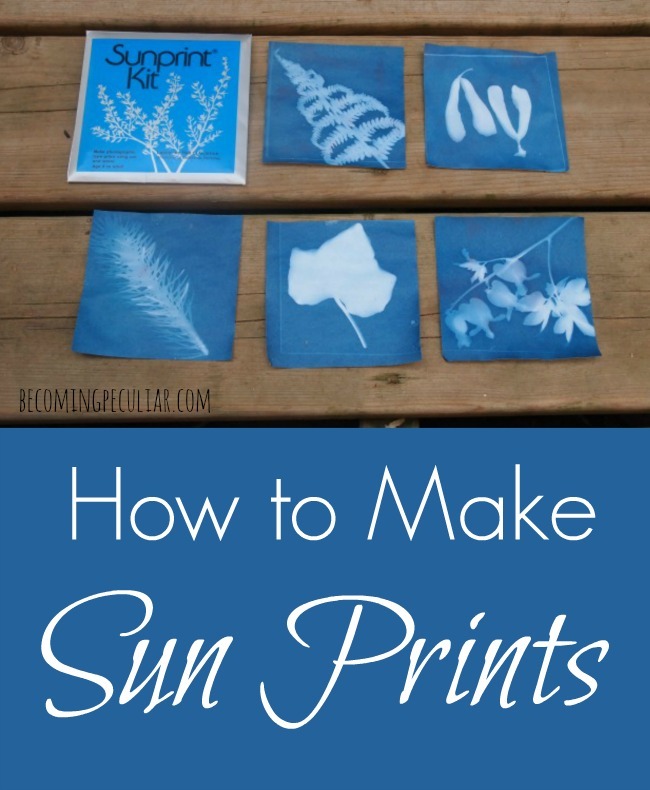 Lydia and I recently did a fun, inexpensive, outdoorsy+artsy activity that I thought I’d share about: making sun prints. It was pretty cool! 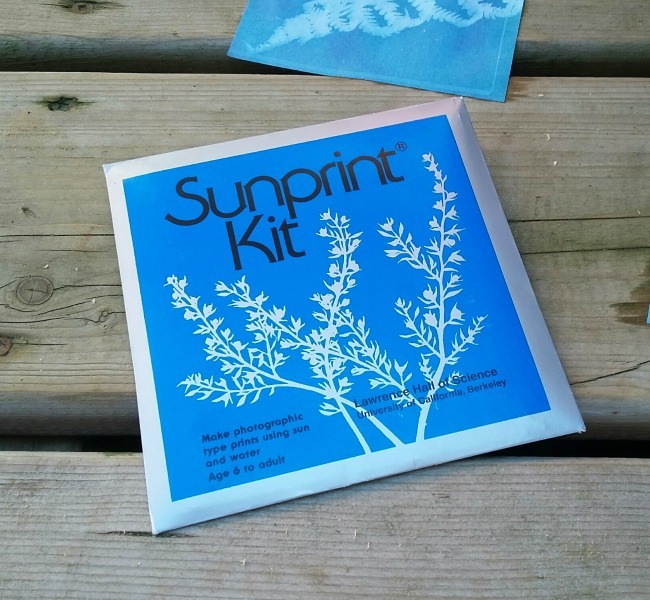 You can buy a little Sunprint Paper Kit for about $6.50 USD on Amazon. That’s the one we got, anyway. 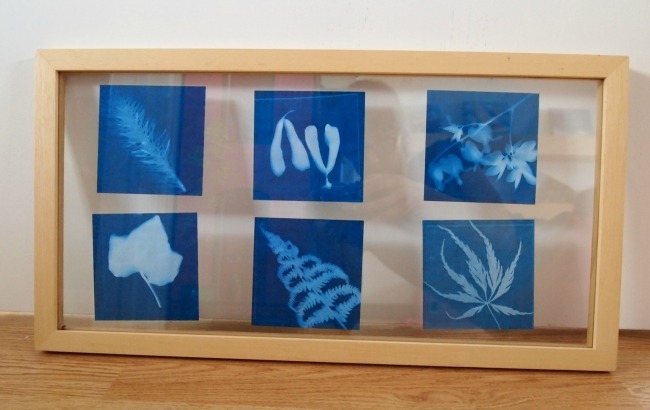 It’s the 4×4-inch kit, and it has 12 sheets of sun print paper in it. Somehow I was surprised how tiny the squares were. 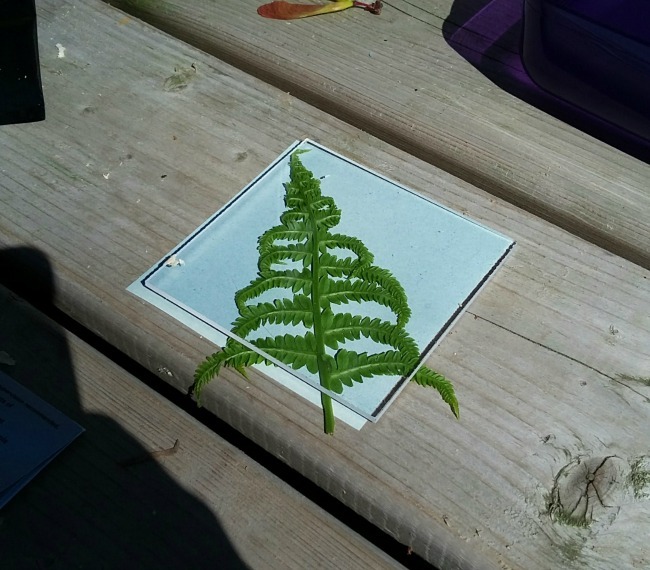 You can only fit, like, one maple leaf on a square. It ended up looking awesome, though, when you put them all together. I discovered you can get much bigger kits, too — in the future it would be fun to try this kit that contains 8×10-inch sheets (i.e. closer to the size of standard printer paper), for about $12.50. 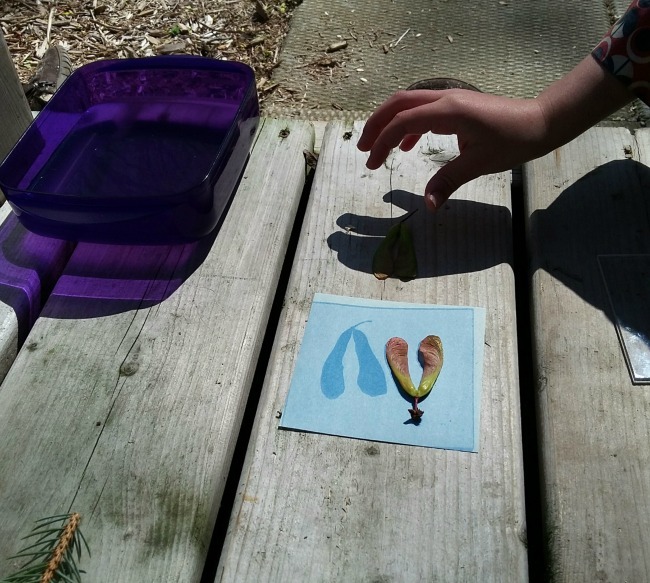 First, gather your materials and take them outside. (You need pretty bright, direct sunshine to get a crisp image.) 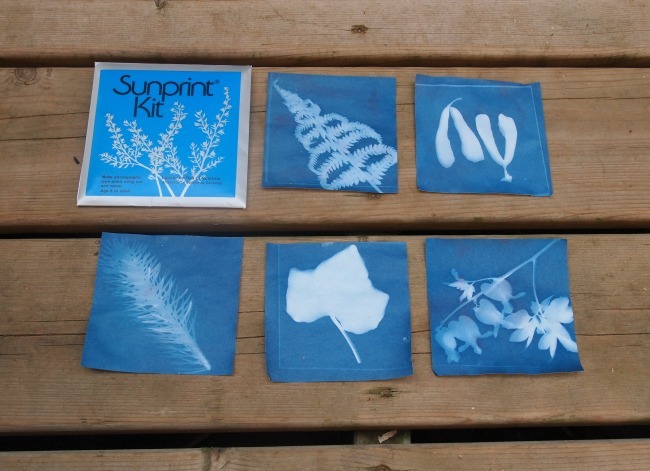 All you need is your Sunprint kit and a small square/rectangular dish of water to rinse your prints. Plus the things you want to print, of course. 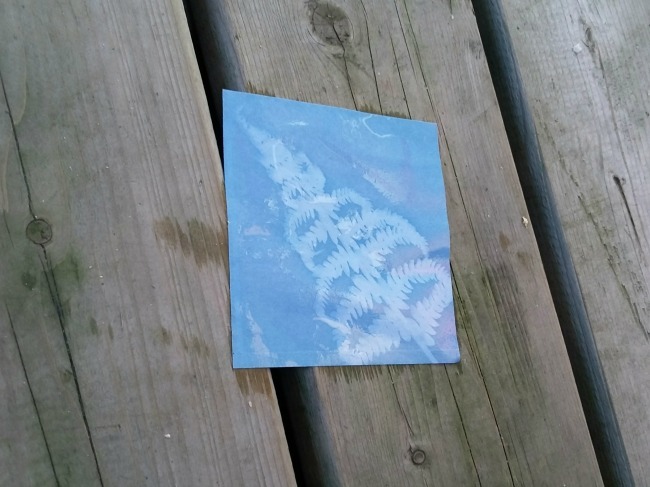 Time to make your prints! You have to make them one at a time, because the kit only includes one acrylic cover. 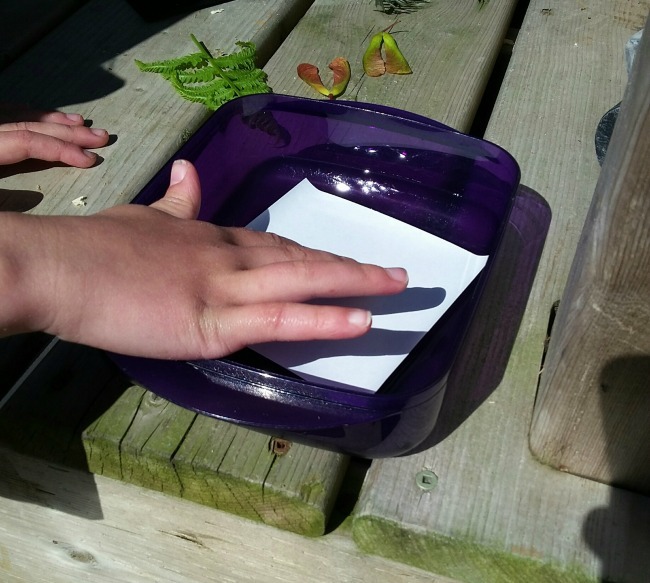 Lay down a sheet of print paper. It starts out blue. Lay your item on top, and then cover with the acrylic sheet that comes in the kit. Tip: we made sure to keep our materials in the shadows our bodies cast as we prepared them. The acrylic sheet keeps the item from moving around. You can print 3D items (e.g. the pine branch) without the cover, but when possible (e.g. 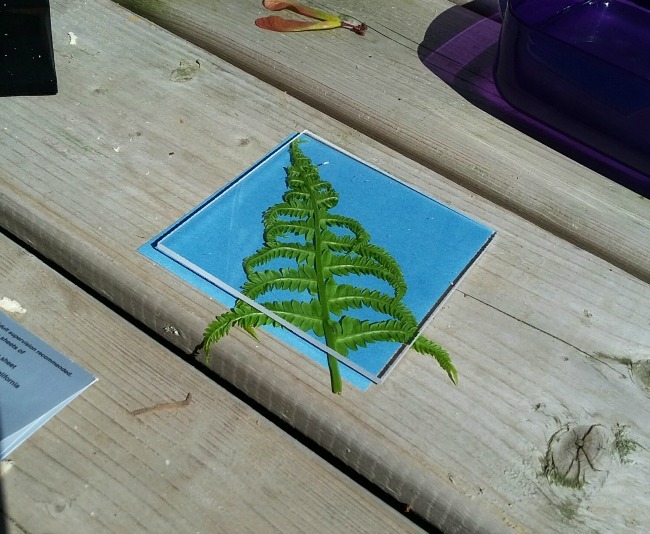 with flat object like leaves), the acrylic sheet really helps. 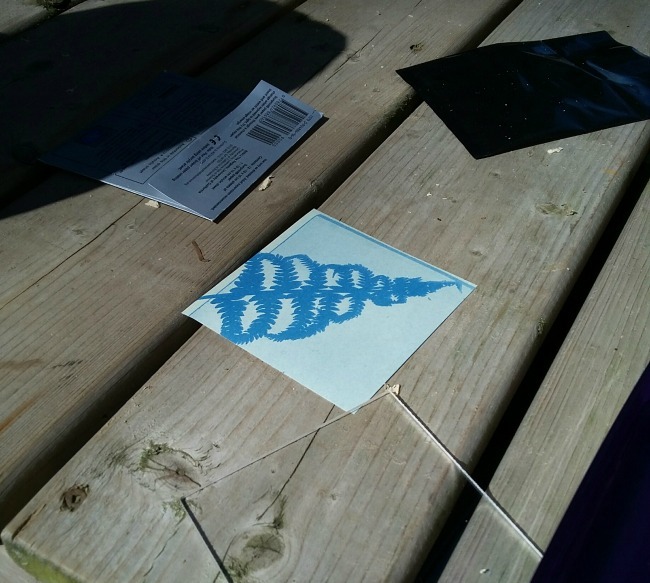 Anyway, let it sit in the sun for about one minute, until the blue turns almost white. Cool! 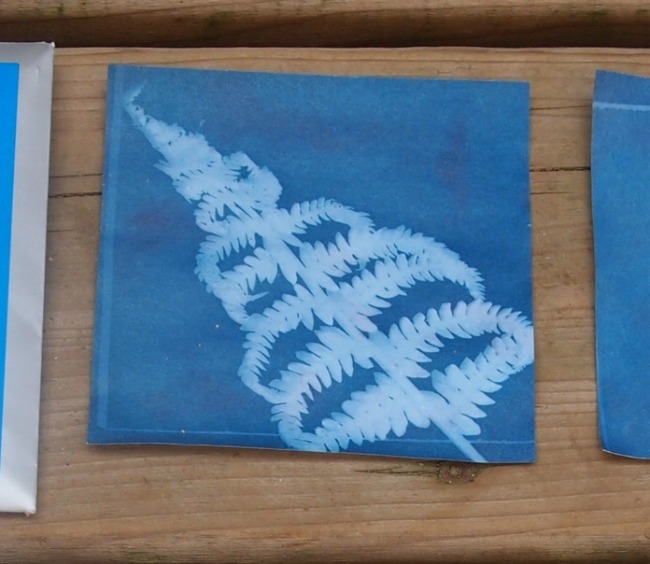 But the magic isn’t over yet: quickly rinse your new sun print in water. For about another minute. 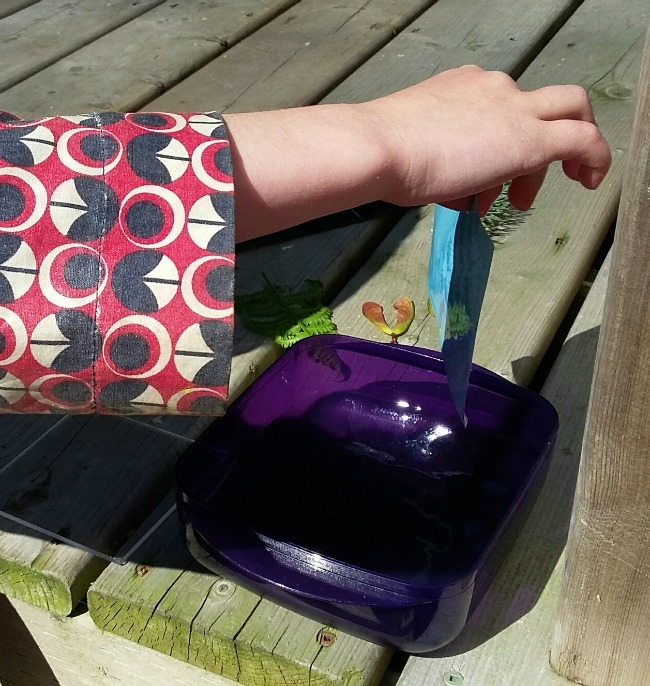 Over the next few hours, the blue will deepen to a deep, rich indigo. 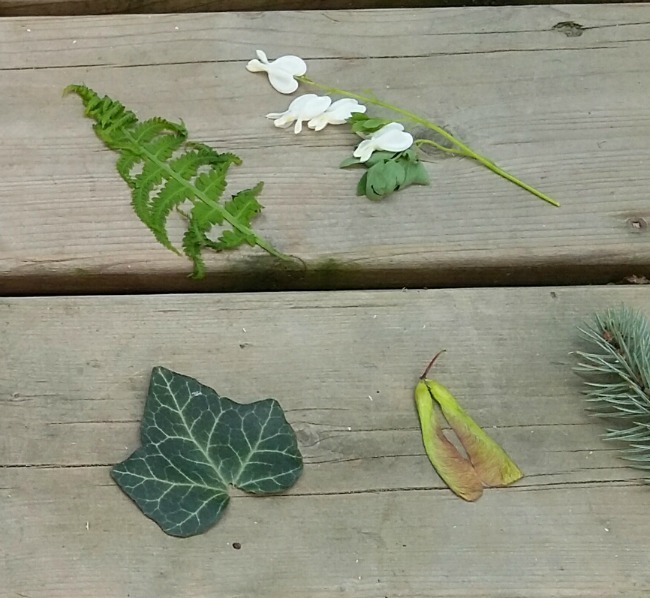 Some other items we tried were maple keys, an English ivy leaf, a pine branch, a Japanese maple leaf, and a stem of bleeding heart blooms. They looked so pretty together that I decided to frame them. I already had a floating frame that was just perfect for this. Lydia wants this up in her room. I agree that it will look awesome! What a lovely piece of artwork! There you go! Give it a try and tell me how it goes! Disclaimer: post contains affiliate links. If you click through and buy something, I get a tiny commission. Thanks for your support! This is so neat!!! Love it!